Aneemah’s Spot is a stylistic mix of stealthy dialogue, rhyme and spoken word. The funeral of “G” brings Wan and Aneemah together to mourn, share histories and choose how they will navigate life from this moment on. Written by Motion, and directed by Charles Officer, the award-winning production stars Amanda Parris and Shomari Downer, and features an infectious sound-scape by DJ L’Oqenz that pulsates like the city that birthed it. Bad Perm will be giving away 3 pairs of tickets just in time for Valentine’s Day weekend for the February 15th and 16th matinées. The play shows at 1PM and 8PM daily and is being held at 918 Bathurst Street. All you have to do is retweet us when we mention @AneemahsSpot with the hashtag #AneemahsSpot2014. The contest closes February 14 at 12PM. 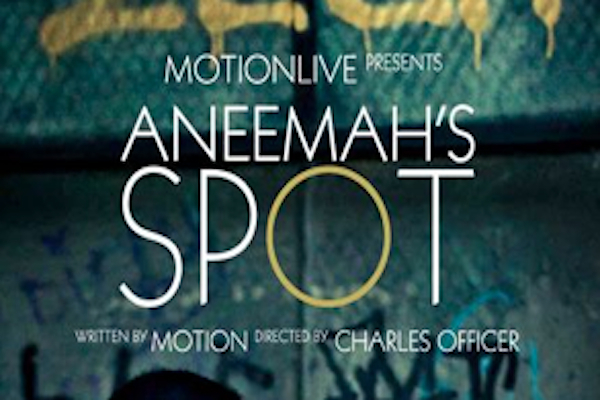 Peep the trailer and the Aneemah’s Spot Mixtape Vol. 2 below.